~ The Finding of Vanishing Lake - Sam Campbell. silencer eyelashes which fringe it, and the wooded hills and cliffs around are its overhanging brows. What is nature? Art thou the living garment of God? A tree is a nobler object than a prince in his coronation-robes. Hill and Valley, seas and constellations, are but stereotypes of divine ideas appealing to and answered by the living soul of man. There were two of us returning over the ancient Indian Trail from Lone Stone lake to the Sanctuary of Wegimind. The day was closing, and we were stepping lively. About midway through, while noting the hectic industry of a brown creeper, we discovered an old blaze high on a Norway pine. Its obvious age and the possible attempt to conceal it by placing it high excited our curiosity. The sap from the tree had long since coated the wound, precluding decay, but had not obscured it. How it had escaped our attention these many months we could not understand. We stepped beyond the Norway: there were more blazes-a trail! Some arboreal spirit from unsounded depths had ventured forth, and returning, had only partially concealed his tracks! It was an irresistible invitation to unexplored depths of the forest, and though the hour was a bit late to follow a blazed trail, we pursued it with boyish abandon. The blazes were well made: one on each side of the tree to indicate the direction of travel, and cut beyond the inner bark. They had not been hacked or chipped out, but made with one stroke of a belt-ax-the work of a woodsman, either white or red. Where they led we did not know, but it must be to adventure, for blazed trails are not made promiscuously in the north country. We stole along as silently as possible, subconsciously trying to imitate the noiseless tread of the fictional Indian, though feeling somewhat that we were trespassers on an estate of the Wilderness Gods. 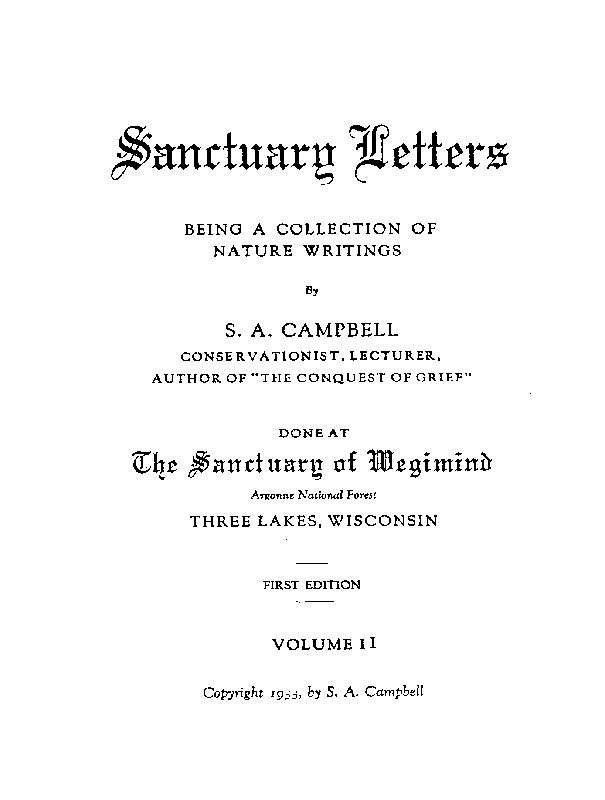 The blazes led us through a charming variety of woods: groves of white pine, over ridges capped with maples and birch, into long, smooth-carpeted aisles of hemlock, and through labyrinths of tamarack and swamp spruce. We were alive with the thrill of discovery, and yet sensed some impatience to find the trail’s objective-the sun did not pause for our convenience, and twilight in the woods quickly obliterates blazes. the promise of another visit, when we arrived at the foot of a steep hill. As if testing our nerve, the trail turned uncompromisingly up the steepest part-perhaps to shake itself free of weaklings. In whispered tones (it would have been vulgar to talk aloud in this great silence), we discussed the advisability of going farther; though our feet, wiser than we, were climbing upward as we talked. Without voicing a decision, we ceased talking to save our breath for the ascent. At points it was so steep we traveled as much by strength of arm as by limb, using the saplings to draw ourselves upward. Still the blazes led up and on, like a siren leading us to some desired fate. Then we reached the crest! Through a framework of young balsams we looked out on a vista that sent a thrill over us, like the dawn of some heavenly revelation. It was dusk! It was still-so still! We were treading paths few had followed! We were adrift in an infinite forest, a sea of gigantic, virile, yet friendly, trees. We were conscious of the Wilderness! of quivering expectancy, we looked down on a little, unnamed Wilderness Lake of such virginal splendor, we gasped in admiration. It seemed another world, as though we were gazing on the materialization of some poetic fantasy. In the gathering twilight the vast forest made a downy nest to cradle the little lake. It was an easy stone’s throw across it, though, obviously, it had not always been so tiny. The contour of the country showed plainly that on some geological yesterday it was much larger. But it had been over-generous with its water; the sun, the wind, and gravity had taken more from it than they returned, so that now it rested quietly intrenched in the center of its former domain, having lost much of its bulk, but none of its beauty. Sphagnum moss was creeping out from its shores,-moss that slowly consumes sedentary waters and renders land. It seemed as if Nature had one day here opened her hand to reveal a priceless jewel in her palm, and now affectionately was closing it again on the treasure. Slowly, silently, gloriously, the lake was vanishing, vanishing! Fleecy clouds overhead caught the first pink tones of sunset, and the placid waters below mirrored the color back to us. On the farther shore, dim in dusk and distance, we could faintly make out the form of a drinking deer. We felt we were stealing a glimpse into the Sanctuary of the Forest King! familiarly? No! No, at least not now. Such charm is like the great minds of mankind; most beautiful at a distance. We would not disturb the feeling of its superiority; we would not break the exotic atmosphere through familiarity. What we had taken thus far would never be missed; but we knew if we greedily grasped for more, we would have less. The atmosphere of thrilling mystery, the wild beauty, the half-eerie weight of wilderness: all would flee to some remote spot if we pressed them. The Soul of the Forest may be sensed, but never possessed! darkness rendered the forest an impenetrable wall. We sat late before the glowing fireplace, dreaming much, saying little, but filled with gratitude for the bountiful gifts of the day. 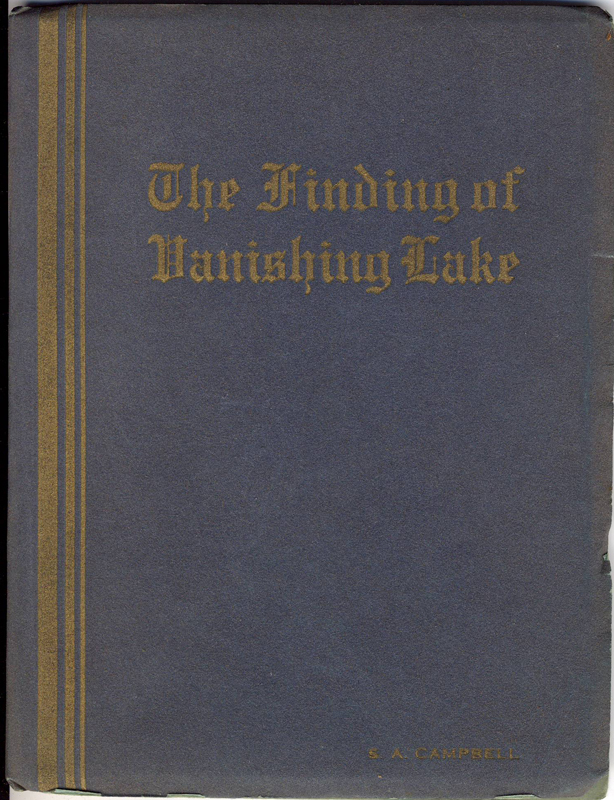 “Vanishing Lake” was added to the vast store of sacred treasures of the Sanctuary of Wegimind. Who will write the Symphony of the Wilderness? What master, with faultless ear, will catch and pen that elusive melody to whose rhythm all Nature moves? What soul so pure that it may rise to that realm “where the air is music,” and gather into notes and measures the Song of the Forest-the song of the tides of verdure, the dance of hills and mountains, the metric march of seasons, the rhythm of erosion, the crescendo of the glacier, the cycle of bud and blade. is eternal, All is divine-All compose the Symphony of the Wilderness. sang through the night like a celestial choir. In these sacred environs he has seemed to hear the tom-tom of Eternity, of which time is the audible beat. He has felt all Nature, from the infinitesimal to the infinite, raising voice in one vast, glorious anthem. The Wilderness Symphony opens with a prelude that is not a beginning, and leads on through a finale that never ends. The Song is from everlasting,-only the auditor comes and goes. Dim in antiquity is faintly heard the divine theme of Creation, first reaching the thoughts of man in whirling gasses, molten rocks, seething vapours, and lifeless matter. But deep in this physical fortissimo are already heard the sweet promises of the life to come. The first seas sang of the forests, of its peoples, and of man. All the vicissitudes of Nature, all the illimitable unfoldment yet to come, was foretold in this primitive theme, whose origin is life’s most beautiful mystery. Elaborating, but never changing, the Wilderness Symphony expands, swells, and leads on through brilliant variations and exquisite climaxes. To the ancient roll of the sea is added the forest voices: the over-tones of the winds, the voluminous hum of insects, the sound of hoof and wing, the hunting cry, the love call, the varying voice of man. It sings of and through Life’s infinite forms. Its tender strains sound from under the blanket of snow, sing as joyously of the falling seed as of the blooming flower, telling as much of life in the autumnal leaf shower as in the spring-time bud. It sings with equal freshness of the arbutus this spring to bloom, as of the ancient, ancient jungles, the rise and fall of continents, the creeping glaciers which came and went leaving the lovely lakes as monuments, the hoary forests that arose upon their shores to intrigue us with their beauty. What marvelous rhythm pervades this Symphony! The lapping of the waves, the ebb and flow of tides, the rise and fall of sap, the phases of the moon, the tempo of day and year, the precession of the equinoxes, all move in perfect synchronism to the magic baton of the unseen Maestro. animals which will people the waters and woods. Changing but never ending, life rising out of life, ever evolving new beauty but never losing the old, singing eternally of the deep secret of existence, yet never divulging it; telling ever of the Divine Principle which animates all life from humble moss to towering Sequoia, yet never explaining it,-so the Symphony of the Wilderness plays on unmindful of our attention, beautiful whether we open ear to it or not, perfect and purposeful despite our faulty understanding. “I am glad that I am not afraid to dream. I am glad that I see in every living, moving thing an expression of intelligence to be understood; every nook and corner of the world as fertile fields for romance; and see in every manifestation of life, even my own thoughts and actions, the testimony of one all-pervading Mind expressing itself through infinite channels. “Trees are living, intelligent beings to me, and I am glad. I see them thoughtfully working out their problem, which is identical with our own: seeking light. They express in unmistakable language, the qualities we most desire in man: courage, joy, virility, reverence, industry, and accomplishment. I am glad that I still hear their gentle murmurs as soft, whispered conversations, and I am glad when, at times, I seem to understand what they are saying. peopled with gnomes, and veiled in delightful mystery; a hill or mountain is a gorgeous, holy cathedral, and its crowning rocks and trees are inspired ecclesiastics. The club moss is the couch of Nature’s gods, the ferns the playgrounds of fairies, the flowers are the joyous song of Mother Earth, even the most humble weed a part of the refrain. “The stars are alive, close, friendly-and I am glad. They talk, sing, have purposes and human propensities, and I am glad. The sky is a vast dome roofing the universe; every point in it is approachable, reachable, understandable. The filmy gossamer of the Aurora is not an unexplained phenomenon to me, but the distant signalling of spiritual beings. right, yet restrained by fear, even as man, and I see in their occasional ferocity the desperation of a soul which cannot understand. An animal is important to me. I feel urged to help it with its problems, and I am glad. “I can see God reflected in man, and I am glad. I see the Hand of the Almighty evidenced in man’s eternal tendency to rise higher and higher in the spiritual scale. This I see in that man should even want to love, to sacrifice for general good, to be honest, to be reverent, to grow in grace. I see in the lowest of men the same degree of Divinity as in the highest, only buried more deeply in an error not his own. In all, great and small, praise God, I see a potential fountain of infinite worth and beauty, which must some day free itself of old impediments, and flow with unmeasured goodness. More solid than matter, sense the cause back Of all effects, and joy eternal sunshine, Through my feet still rest in shadows. Thus wrote the poet Bryant of that supreme, inexplicable miracle we call “The Forest.” “God’s ancient sanctuaries” indeed! and today if they are held at lower level in our esteem, the error lies in concept, and not in any possible depreciation. as startling in the instincts of the ant as in the forest wisdom of the ponderous moose. And from microscopic organisms to the orbits of galaxies, all Life moves to laws not of its own making, testifying to the infinite power and intelligence of the Creator of all. What more fitting place of worship than the Forest, where there is such multiform evidence of Him whose name is Love! What greater heresy than to violate these Sanctuaries, which the hands of man cannot again fashion! thoughts, and found food and medicine in the very life blood of his arboreal guardians! He found buried treasure deep in the earth that trees of other ages had left for him; he learned that the roots of the forests hold the very earth in shape; that they foster lifegiving rains, yet prevent floods, while birds and animals thrive in their affluence. And now, as man stands abashed at the vacuum of materiality, these tireless mentors furnish him with spiritual guidance. Their beautiful fingers point his thoughts aloft, away from earthly concepts. Where man once saw in them but objects of utility, he now finds beauty and inspiration. Surely, surely this feathery green covering which spreads over the world and its life is the protecting wing of the Almighty! A tree is, indeed, a faint slit in the veil, through which shines into consciousness some of the glories of Heaven! We need a new public attitude toward rain; we need to love it more! have hewn down our great trees, whose broad expanse of leaf surface gives inestimable quantities of moisture into the atmosphere each day; we have trapped our beavers and blasted their dams, draining the life-giving flowages. The seasons have become more and more dry, as the atmospheric circulation of the earth’s plentiful supply of water is thus interrupted. There is deep benefit in rain, and we may be joyous in it whether it alters our plans or not. A shower may disturb the planned picnic, but how differently it looks to the ranger who anxiously scans the country for each telltale curl of smoke, and with quick and courageous decision dispatches crews of men to fight the advance of flames through the parched forest. It may halt the contemplated motor trip and forbid the outdoor games, but how welcome to the thousands of tiny trees which have been set in furrows, in an effort to bring back our forests! to the glowing gratefire. The shower developed into a steady rain, and we sat passively attending a procession of unconnected thoughts. One of the party was bewailing his inherent misfortune in self-righteous fashion. There was no effort at good humor in his voice. He believed himself a martyr in Nature, and resented the fact. Also, he was proselyting. A martyr loses his martydom if his position does not draw the sympathy of the multitude. A happy remark or a cheerful smile was enmity against our friend that day. A deeper silence crept over the group. The rain fell more intensely, beating its rhythmic symphony on the roof. Without, the deep, black forest seemed lulled to sleep by the drone of the steady downpour. Introspection fitted the moment. “Emerson’s ‘Self-Reliance,’ is it not,” said one of the party, whose eyes glowed with awakened thoughts. “A perfect presentation of the originality and individuality of man,” added a third member. “Rather fatalistic,” commented the Martyr, still wishing someone would talk about the rain. After another lively discussion, it was finally agreed that man’s claim to progress lies in unceasing action; that he swings through life, as a planet through space, by a power not his own. That, unlike the planet, he knows of his own existence, and of his native abilities; that he is gifted doubly by the Creator; firstly, with potential ability sufficient to his station in life, and, secondly, with potential energy sufficient to develop and apply this ability to circumstances in need of it. The enemies of this expression of latent worth were thought to be the ramifications of the sense of self: self-consciousness, self-ishness, self-pride, self-pity, self-love, and sensitiveness. reached in the philosophic discussions. The Martyr forgot his injuries, and swung happily along the mental trail to self-improvement. At sundown, the clouds parted in the west, and the sun magically lighted the cleansed landscape. The party, whose steps had been happily guided to a new spiritual realm, walked down Sunset Trail under the dripping trees, and looked on the new-born world with glowing faces. “And we owe it all to the-rain!” added the Martyr, with final emphasis, determined to express himself more fully, now unashamed of the divine idea he represents.